* Penryn Core 2 Duo chips: 2.4GHz, 2.66GHz, 2.8GHz, and 3.06GHz. * 2GB of RAM (MacBook); 4GB of RAM (MacBook Pro). * Hard drives: 160GB — 320GB. * Glossy widescreen TFT screens. On the MacBook: 13.3-inch (1,280×800 resolution); MacBook Pro: 13.8-inch (1,366×768). * Integrated NVIDIA graphics system. * New, all-aluminum enclosures, white, black and silver. (Would love to see multiple colors, but think its unlikely — it’s an inventory nightmare, especially for high-priced products). * Enclosure is tapered: very thin at the sides, thicker inthe middle, like the iPhone 3G and MacBook Air. * Magnetic lid latch on all models (replacing mechanical clasps on the MacBook Pro). * All ports on left side — including FireWire 800. * Slot-loading optical drive on right (no Blu-ray). * Extra-large battery pack running full width of computer at the front, under the touchpad. * Recessed keypad like MacBook Air. Keys are Chicklet style on MacBooks, black and backlight on Pros. * Price: Starting at $800. This is the mysterious “product transition” that Apple CFO Peter Oppenheimer said in July would impact Apple’s gross margins. “We will be delivering state-of-the-art new products that I cannot discuss today that our competitors will not be able to match,” Oppenheimer said during the Q308 conference call. This is my perdiction for what its worth. I also think the Pro will have a recessed keypad like MacBook Air. But I think the keys will be metal with backlight in the Chicklet style on Pros. How will the tapered edges work with all the ports and dvd? The air uses the “drop down” port. The spy shots found yesterday show a squared off chassis so I’m not sure about this one. * Screen: I know many like the glossy screen, but why would they drop the matte option when many others absolutely hate it? Also, 13.8″ MBP? Maybe same size as MB. * Enclosure: I agree that they will all be aluminum (no colors). Won’t be tapered as much as mock-up at top. * Optical Drive: I’m really holding out for the Blu-Ray, so I hope you’re wrong here! * Price: I think the price will start at $949, not $800. I just don’t think it would happen. Can’t wait to see, though. I’m sure there will be something really cool that no one has really considered. Apple always surprises! 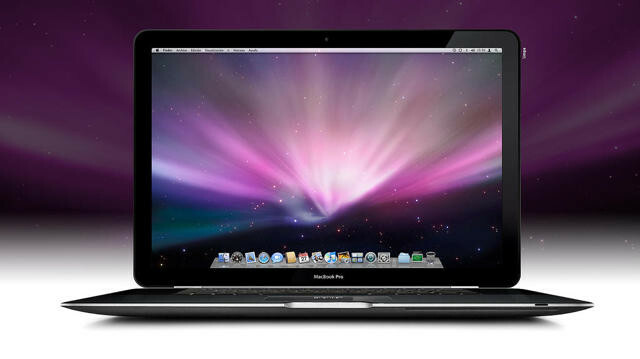 MacBook Pro with 13.8″ screen? Nonsense! Who came up with that silly idea? How about a real Apple docking station? How about internal 3G? PLEASE have a non-glossy monitor option!! Glossy is a nightmare for designers. Also yea, the tapered look isn’t so pretty. MacBook Pro with 13.8 screen would be absolutely useless.I’m also worry about discontinueing matt screens.I would say 15-17 mac book pros,15 macbooks and 13 and 11 mac book airs.you can’t work on 13 inch screen ,unless you just want to check your emails on a cafe.but the $800 staring price is really necessary if apple wants to stablish a bigger laptop market. Since when does a price drop translate into a product transition? Sorry, don’t see it. Many seem to think the product transition was the ipod touch going from media player to game system but alot of Mac folks seem to have missed that. – 13.8″ MBP? Deal killer for a $2K computer. – Black keys? Why make your new model look like a 7 year-old Titanium? 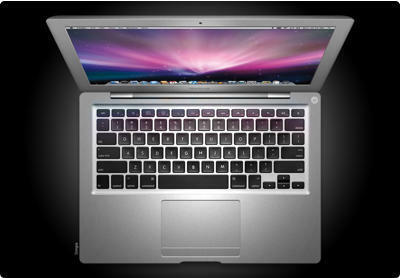 -Taper on MB maybe, but can they shoehorn an MBP in there? – Aluminum colors (even black or white)? I think they’d have learned from Dell’s mess with painted metal cases. – Integrated graphics? Not on the Pro. – Battery in the front is good, if just heat protection for your thighs. Battery size shape may be harbinger for next generation of better batteries, if only lighter. – Fewer models: Low and High for each. Besides reducing cost, keeps MB from cannibalizing Pro sales. – a change to 1.8″ drives. It likely means 120GB to start. Besides space savings, using one form factor makes a lot of sense economically. It also makes the next iPod classic refresh a no-brainer. – SS Drive for idiots (though the Dow may have already killed that niche). – Choice of white for all MB models. Apple never offered it for high end MBs, so they don’t know if they lost some sales to the cheaper white model. If there’s a shakeout they’ll drop the color that lags at a refresh. – blu-ray option at first minor refresh – gets the fence-sitters to jump. – It’s not a MB, but possible addition of FW800 to iPhone at next iteration (why else bother? If you need a giant RAID ethernet is probably as good or better). If it’s popular then add it to the classic and touch. – A SATA port? But that could be a FW800 killer. – Single USB. If you want more spend 8 bucks on a hub. – More magnetic cable connections. Negates the need for a docking port. Oh, if they can actually do aluminum colors, a shiny black (REALLY SHINY) MB Air. if the MBP screen drops below 15.4″, i’ll probably be forced to switch back to PC. i agree 13.8″ would be completely useless. i like the idea of a 16.4″ screen though, or better yet, a hi-res 15.4″. I hope it’s not a glossy screen. Nothing is more difficult to see in strong light than anything on a glossy screen.